Want to discover the classics? You’ve come to the right place. One of the most beautiful buildings in the area, St. John the Evangelist Library represents the compelling nature of the truths we teach in our classes. As the academic nucleus of our campus, it houses a high quality collection of books specifically designed to support the Catholic liberal arts curriculum and faculty research. Completed in 2004, our library, named in honor of Our Lord’s “beloved disciple,” has a collection of more than 90,000 volumes specifically designed to serve and support the intellectual and spiritual formation of the students, faculty, administration, and staff. 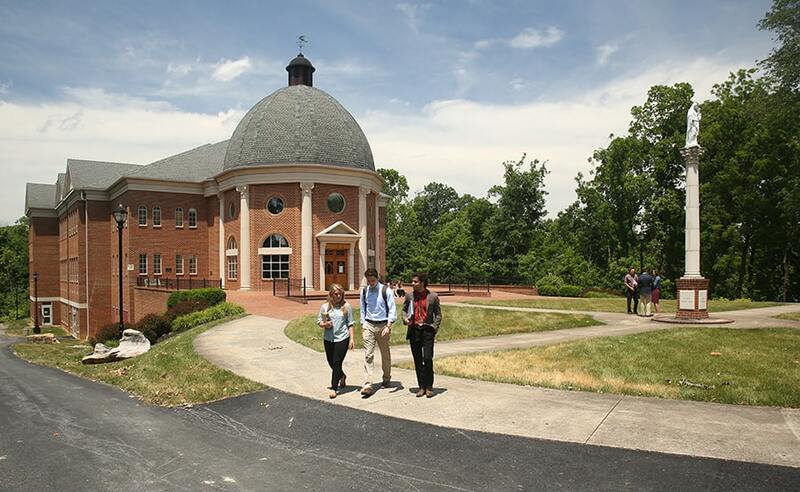 With this in mind, the library aims to provide an uplifting atmosphere and excellent instructional, reference, collection services, and other educational and cultural events to the constituencies of Christendom College. The Reference Collection, located on the Main Level, contains general and specialized encyclopedias, dictionaries, handbooks, maps, and other resources which aid students in their studies and research. The collections include such important sources as the Leonine Edition of the Opera Omnia of St. Thomas Aquinas, the Acta Apostolicae Sedis, the complete Acta Synodalia of the Second Vatican Council, more than 250 volumes of the United States Supreme Court Reports, and the collection of Senior Theses from the first Christendom Class of 1981 to the present. Internet Public Access terminals are available in the Information Commons in the central area of the Main Level, providing access to in-house and online electronic resources and the library’s catalog. The catalog is also available at several computers located among the general collections in both the Main and Gallery Levels. A public photocopier is available in the Reference area on the Main Level. The Library also has a growing multi-media collection providing both educational and popular titles. The Main and Gallery Levels house the monograph collections supporting the academic disciplines taught at Christendom College. These levels also offer numerous individual study carrels, four small group study areas, and one larger Senior Study Room. The Rare Book and Special Collections Room in the Gallery Level includes rare collections of lives of the saints; histories of religious orders and other ecclesiastical, spiritual, and literary works in several European languages from the sixteenth through the nineteenth centuries; and a thorough collection of works by and about G.K. Chesterton and Hilaire Belloc, and other Catholic luminaries, many of them first editions and fine printings, including a rare complete run of the journal G.K’s Weekly. The Periodicals Collection is housed in the Main Level, surrounding a comfortable reading area containing the current issues of the collection. A Microform reader-printer is available in this general area. The Library receives some 250 periodicals and has a developing collection that includes some 1,000 reels of microfilm and microfiche. In addition to these print titles, the library also offers access to more than 50 full-text electronic books and periodicals primarily through VIVA, the Virtual Library of Virginia Consortium; these are available at any of the terminals located in the Information Commons, adjacent to the periodicals reading area, or on computers anywhere on campus. Interlibrary Loan services are readily available to students, faculty and staff, offering access to the collections of libraries throughout the country and the world. The Reference Department provides instruction on research techniques for students at all collegiate levels. This instruction includes structured sessions for groups of students, a five-week, 1-credit Advanced Library Research course, and walk-in or private sessions for help on specific projects. The St. John the Evangelist Library has been designed to grow to a collection size of 130,000 monographic volumes, 5,000 audio and video cassettes or alternate media, 30,000 bound periodical volumes, and a total of some 500 current subscription titles—in both print and electronic formats. The Library’s Lower Level houses five classrooms, two student computer labs, a Media/Language Lab, and a multipurpose room. 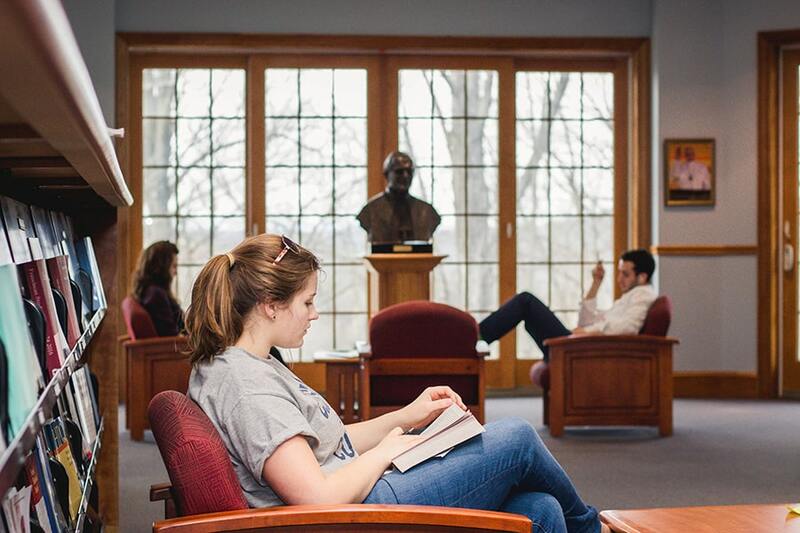 St. John the Evangelist Library is the center of the academic life of the Christendom College campus, and is open 94 hours every week.